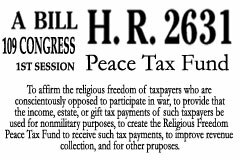 The Religious Freedom Peace Tax Fund has been proposed to allow for those who are conscientiously opposed to participation in war to allow for proper social contribution without supporting the war machine. Our military budget out spends every other country by more than three hundred seventy billion dollars. If we were to apply one third of the military budget to developing energy independence imagine how quickly we can have alternatives that would no longer require us to be in someone else's backyard and someone else's business.